Located in eastern Albania, this county consists of the Devoll, Kolonje, Koroe, and Pogradec districts. The county's eastern border lies on Albania's eastern border, and calls the Republic of Macedonia in the northeast and Greece to the southeast as its neighbors. 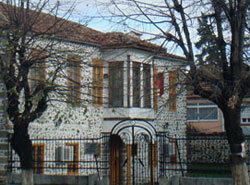 Korce City (pop: 58,000) is Albania's seventh largest city. It is on a plateau near the Greek border, amid the scenery of the Morvava Mountains. Its residents are mostly ethnic Albanians, although some Macedonians and other nationalities live here too. The city is one of the centres of Albanian identity, and for centuries has been one of the most important centres of both the Orthodox and Muslim religion, with an elaborate 15th century mosque, and the seat of the Orthodox Bishop. In the 19th century, Koroe established the first school for girls in Albania, and the first school teaching the Albanian language. Pogradec City is a one of the country's busier parts, and tends to attract artistic types. Pogradec's inspiring scenery has given the city ts nickname, "The Poet's City".